Your environment will always play a huge part in determining the state of your mental health. From your immediate home life to the city/town where you live, the energy and feel of that place can greatly impact your general mood and state of mind. Sometimes, if you find yourself living in a place where you just don’t feel comfortable or happy, a change of scene can make a huge difference in your ability to manage your ADD/ADHD. Many people say that living in large cities can actually be damaging to your mental health, but small towns aren’t necessarily much better. It all depends on what kind of person that you are. 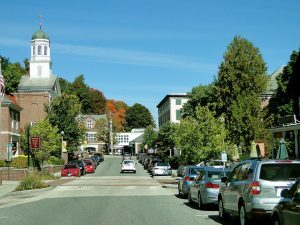 Small towns offer many benefits that big cities do not, but also many drawbacks. This can especially be true to an ADD/ADHD sufferer. Small towns can be much less expensive than living in big cities. In larger cities, simply paying your rent can take up a majority of your monthly income. If you want to live in a nice apartment in a safe neighborhood, while still have enough room not to feel cramped, it is unlikely that you will be able to find a place for under $1500 in some cities. If you are living on a fixed income, this can be a huge financial burden and stress on your mental health. In a small town, rent is usually much cheaper. Not only that, if you have a decently paying job, you might be able to afford an actual house, rather than simply a small condo. If you are someone who wants a place that you can call your own, have room to spread out, and still keep money in the bank, a small town can offer you far more affordable housing. Living in the city offers those with ADD/ADHD one major benefit: there is always a ton to do. There are so many more businesses, activities, shopping centers, events… If you are someone who needs stimulation, a big city can offer it in spades. In a small town, things are more… let’s say, laid back. Almost every small town has basic amenities, like a movie theater, a mall, restaurants, etc. But your amusement choices will be far more limited than if you are living in a city. There are usually events, festivals, and other community activities throughout the year, but with far less variety and choice than you would have in a bigger city. The flip side of the “less to do” coin is that, well, there is less to do! You don’t have constant, overwhelming stimulation coming at you from all sides. In a small town, you can go out for a walk and not see a soul. For someone with ADD/ADHD who is in search for a sense of calm, this can be a godsend. This really does depend on how your ADD/ADHD presents. For some people, peace and quiet can allow them to focus on their condition and mental health. It offers them a chance to remove themselves from the stresses of the big city and instead work on themselves. Now, that isn’t knocking small town hospitals. Many small towns offer fantastic medical and mental health support systems, but few offer specialization. If you are someone who is suffering from a severe case of ADD/ADHD, you might not be able to find the necessary support in a small town for your condition. You could always commute to a big city, but that can be expensive and exhausting. The internet can offer valuable mental health support to those with ADD/ADHD who live in small towns. Although I believe that one-on-one personal coaching is one of the best ways to help take control of your condition, being able to reach out across the internet to mental health coaches and professionals can be game-changing for some who live in small towns. So, should you consider living in a small town if you have ADD/ADHD? That completely depends on who you are and what you need. Some people absolutely love the calm and slower pace of small towns, as it allows them to catch their breath and concentrate on themselves. Others might find it absolutely, mind-numbingly boring. If you are considering a big change of scene in your near future and want to talk about the potentials pros and cons of moving to a small town, please feel free to book an ADD/ADHD coaching session with me. Together, we can examine your current life, what you feel that you need out of your immediate environment, and help you make an informed decision that is right for you and your specific case of ADD/ADHD. This article was posted in ADD/ADHD, Coaching and tagged ADD, ADHD, coaching, environment, mental health, small town, stimulation. Bookmark the permalink. Follow comments with the RSS feed for this post. Comments are closed, but you can leave a trackback: Trackback URL.